Several months ago I posted a contact email address on my blog to allow you the reader direct contact if you wished. 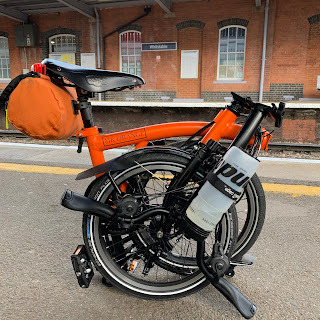 On the whole this has gone well and I regularly have emails from people all across the world asking questions about all things Brompton, London and the items I occasionally review. Of course I regularly receive emails from companies saying they have a wonderful investment opportunity and a few offering non surgical enhancements. Since Brompton announced the date, time and venue for the 2015 Brompton World Championships, I have been getting a steady stream of emails asking what I think. In fact I have received more emails about this issue than any other so far this year. A few people writing to me have not been particularly happy. So rather than reply to individual emails I thought it best to offer my thoughts and observations here. Okay. The details of the 2015 Brompton World Championships. It is going to be held in London for the first time, on 1st August at 17:00 at the end of the Ride London event where for one day a year the many of the streets of London are devoid of cars and the bicycle in all its forms take over for a few hours. The event is restricted to 575 riders who will have - like yours truly - enter a ballot to participate in the event. The route is quite spectacular and involves up to eight laps of St James' Park. This includes racing along The Mall in sight of Buckingham Palace. Iconic location or what!! This will be the 10th Brompton World Championships and therefore quite a milestone. I don't propose to respond to each of these in turn and will merely provide my general thoughts. As far as location goes the BWC 2015 could not be more iconic and I felt excited about it when I heard where is was going to be. The spectacal of 500+ Brompton bikes racing along The Mall with Buckingham Palace in view is nothing short of intoxicating. I had the pleasure of riding at Blenheim and Goodwood and really enjoyed both and there was a special atmosphere. Surely the London location would be the same if not more!! In previous years if you signed up early enough you were almost certain to get into the BWC. Sadly with the ballot this is no longer a certainty and the nervous wait begins. I suspect this aspect might be the biggest gripe regardless of what people say. I know that I felt maudlin upon reading the word ballot. I am waiting too of course and will be very disappointed if I don't make the cut but I can understand why the event has deemed it necessary to place a cap on numbers. The actual race comes at the end of another very popular event. Closing central London roads at any time is surely subject to very strict conditions and Brompton wanting their event at this iconic location has probably had to slot itself within a tight window. Location has possibly paid a very big part in the Brompton decision making process. Given the opportunity to have a great event in such a prime location would have been ridiculous to turn down - even though it restricts participant numbers and introduces the dreaded ballot. What company in their right mind would turn this down? Brompton is a company. They are in my humble opinion a pretty good one. They exist to make bikes (you all know what I think of their bikes) and turn a profit. In doing this they employ several people, export to all corners of the globe, innovate, champion engineering and remain made in London. If by having the BWC here in London it further strengthens the brand, keeps them making bikes in London, innovating, keeping people in employment and turning a healthy profit, I have to support it. As for Brompton not caring anymore, as I have written Brompton is a company wanting to sell lots of bloody good bikes and turn a profit. I am not sure what people expect from it? I would say that in my experience they go beyond this. They seem to be passionate about keeping owners happy. First they try to make the Brompton you buy today last. New improved parts can generally be retrofitted. Image buying a car five years ago and being able to keep it as up to date as a new one. Second I have attended several events where I have been made to feel very welcome, not to try and sell me another Brompton but as a thank you to loyal owners. Finally, I am just happy they put on a BWC. Remember their primary aim is to make bikes, sell them, make a profit, employ people and innovate. The organising of any event, even if it is a wonderful marketing tool, must deviate them slightly from this. In addition, last years BWC almost didn't happen as events out of the control of Brompton put it in jeopardy. Brompton rallied and the event took place. As I type this I have a long and agonising wait. Regular readers will know just how special the BWC has become for me and many of my friends. If I get in it I will be elated. If I don't...well I think you can guess. So, don't give Brompton a hard time for grabbing what might be their one and only chance for a truly iconic backdrop for the 10th BWC. If you worked at Brompton, what would you do? I've never participated to former BWCs, and won't attend incoming one, but always take pleasure to read (or watch) reports of these events. I totally agree with your opinion that a bunch of 575 Brompton riders spinning in the heart of London should be spectacular, and good for this londonian company image. If this is only a one shot for the 10th anniversary of BWC, drawbacks of this event should be accepted, knowing that this should become a great vintage remembered during lot of time. Brilliant Mudguard Solution for your Brompton! The Conquest of Ditchling Beacon on a Brompton!